There has been speculation in recent weeks that the leaders of Kosovo and Serbia have explored the option of a land swap, with some predominantly ethnic-Albanian areas of Serbia being traded for Serbian majority areas in Kosovo. Michael Rossi argues that an exchange of territory would do little for the Serbian or Albanian communities involved and could pose a threat to the stability of the region. The increased chatter around normalising relations between Serbia and Kosovo has seemed to once again revisit the taboo topic of partitioning the territory, even though all participating sides have officially dismissed such ideas in the past. More recently – and more ominously – there has been talk of a potential “land swap” that would exchange the Serb-inhabited area of northern Kosovo with the Albanian-inhabited Preševo Valley as some sort of “compromise” between presidents Aleksandar Vučić and Hashim Thaçi. Again, all of this appears to be little more than gossip for the time being, but even rumours are enough to raise tensions in an already tense region. Moreover, with international observers opining this month on the potential dangers of border changes, one would think those people in charge would issue some sort of statement to put these rumours to rest. Unfortunately talks of partition only seem to be intensifying. In the last few days, Serbian President Vučić has advocated for some sort of “delimitation” with Kosovo. Whatever that means currently remains a mystery, as Vučić is prone to keeping vaguely-worded statements a secret for his own ends. Whether it is, as Daniel Serwer observed, a euphemism for “partition”, or simply a “correction” of borders that exchanges a few villages here for a few there, as Wolfgang Petritsch tried to clarify, is unclear. Along these lines, Kosovo President Thaçi has openly dismissed talks of “partition” yet still somehow envisions the Preševo Valley merging with Kosovo in a final settlement with Serbia. How this will work is something only Thaçi seems to know. Additionally, from what we know of border “corrections” and “demarcations” Kosovo has made with Montenegro, the subject is highly controversial for political hardliners who have openly disrupted parliamentary sessions with tear gas to prevent discussion of Kosovo giving up any of its territory. All of this has unleashed a series of reactions in the Serbian and Kosovan press trying to figure out what deals, if any, were made behind closed doors in Brussels between Vučić and Thaçi. That Kosovo has failed in forming the Assembly of Serbian Municipalities (ZSO) that has been so crucial to the 2013 Brussels Agreement may be reason for Vučić to conclude progress is at a standstill and alternative options need to be considered. If talks of a land swap with Thaçi have happened, this does Pristina a huge favour since it not only alleviates them from the responsibility of forming ZSO, but it relieves them of having to worry about a contentious north that has never come under Pristina’s control. Whatever the reason, it has left Serbs in Kosovo visibly and vocally shaken as to a future they seem to have no input in. The Serbian Orthodox Church in Kosovo has adamantly proclaimed any and all opposition to partition that would leave more than sixty percent of its people south of the Ibar River (the assumed dividing line) in a rump Kosovo that would ostensibly include an additional thirty to forty thousand ethnic Albanians from the Preševo Valley. The internationally respected Abbot of Visoki Dečani Monastery, Sava Janjić, has become a one-man advocate on social media in highlighting the fears and uncertainties he and his flock seem to face from Belgrade apparently abandoning them to an unknown fate – an ironic decision considering the parts of Kosovo that actually matter to Serbian cultural, historical, and religious identity are almost all in the part of the territory Belgrade would write off if partition were accepted. In a seemingly surreal event, officials in Belgrade are even castigating him and the Church, the very symbols of Serbia’s presence in Kosovo, for being recalcitrant to government ideas. 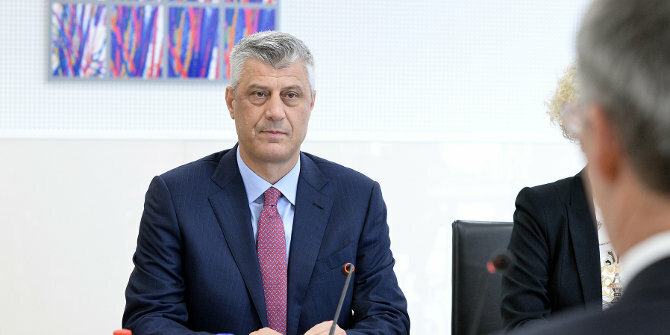 Among ethnic Albanians, Hashim Thaçi is risking becoming persona non grata within political and journalistic circles for apparently making a deal that would shear off northern Kosovo, and with it, any hopes of ever attaining control of two critically important industrial assets for Kosovo’s weak economy: the Trepča Mining complex, and the Gazivode dam and hydroelectric plant. Both were already feared of being monopolised by Kosovo Serbs in any arrangement that creates ZSO, but with a formal partition, the territory would effectively be lost to another state. To add to the uncertainties, Russia has recently announced its willingness to support whatever agreement Serbia reaches with Kosovo, under the blanket statement that it has always supported Belgrade’s decision regarding its own territory. In short, partition, which has always been an option denied by international actors, now seems to be considered a viable alternative to an intractable frozen conflict between Serbia and a disputed territory. If such an agreement includes Serbia’s recognition of Kosovo and its subsequent entry in the United Nations as a de jure state, the fate of a few ten thousand Serbs in Kosovo may seem like a small price to pay for a definitive peace. The problem, as many have already opined, is that partition (or land swap, delineation, delimitation, border correction, or whatever synonym is used) is both problematic and dangerous, and should be resolutely rejected by all concerned international actors. Along with the risks it carries in opening the proverbial “Pandora’s Box” for at least a dozen similar breakaway entities, there are key issues concerning the stability of both Kosovo and Serbia. First, partition does nothing to benefit the Serb-inhabited regions of northern Kosovo. The assumption among many is that northern Kosovo remains the last major foothold Belgrade has in the region. This is not entirely true as the lack of any central authority in nearly two decades has created a unique set of powerbrokers that include political strongmen and organised crime heads that effectively run the region. They may defer to Belgrade, but they control the day-to-day operations and have amassed sufficient wealth and prestige to be their own voices and decision-makers in Kosovo’s future. Thus to reabsorb them into Serbia proper risks a highly likely power struggle between Belgrade attempting to reassert control, and the powers that have run the region as their own fiefdom since at least 2008. Within Kosovo, the region receives disproportionate international attention that includes both political and economic investment. Within Serbia, the region would leave international attention, with North Mitrovica, a city itself divided at the Ibar, becoming just another run-down neglected border town. Whatever privileges the north has been receiving would most likely be lost. Second, a hypothetical land swap equally does nothing for the Albanian-populated regions of Preševo. Calls among hardliners in Pristina to annex what is sometimes referred to as “Eastern Kosovo” are rarely, if ever, echoed by Albanian officials in Preševo who, like their Serb counterparts in northern Kosovo, enjoy a special status as a mobilised minority that can use its leverage to extract concessions from the political centre under threat of ethnic unrest. If they merged with Kosovo, these advantages would disappear as they would no doubt be forced to be subordinate to another set of political elites and factions in Pristina, where rival groups jockeying for power already make politics a contentious profession. Beyond that, it is still unclear whether any solution reached with Serbia will guarantee Kosovo’s status as an internationally sovereign state. Currently, Serbia is under no real pressure to extend formal recognition, which is also opposed by a number of states in both the European Union and the United Nations. Thus, if any compromise reached leaves out the critically important requirement of recognition, which it very well might, it does Preševo Albanians no good to go from being citizens of an internationally recognised country to joining a disputed territory with no hope of gaining constitutive sovereignty. Third, partition critically endangers any future for Serbian communities or cultural heritage in central and southern Kosovo. Serbs south of the Ibar are scattered in a series of disjointed villages and municipalities; the largest being the town of Gračanica, which numbers just over ten thousand Serbs, and prior to 1999 served as little more than a village suburb of Pristina. Any partition or land swap severely reduces their presence and political voice without the North serving as an urban stronghold. With the thought of being abandoned by Belgrade, and with the possibility of Pristina being even less inclined to offer them any form of political autonomy than they are now, most Serbs would feel compelled to leave. What remained would be little more than an ethnographic novelty, useful only insofar as it would allow international officials to visit the region and convince themselves that Kosovo remained a multiethnic state. Fourth, partition undermines years of dedicated efforts by the international community to find a lasting solution. Kosovo was envisioned by its sponsors to be multiethnic. This has been repeatedly encapsulated in documents like the Ahtisaari Plan and the Brussels Agreement which empower the Serb communities to a degree where they feel safe and secure enough to live ostensibly in another country. What tends to be lost in the narrative is that Albanians always considered multiethnic consociationalism a price to be paid in exchange for international assistance for their own long-sought self-determination. It is usually forgotten that while Kosovo’s separation from Serbia may have been predicated on conflict in 1999, that conflict stems from a longstanding desire by its ethnic Albanian community to boycott participation in all Yugoslav associations in order to eventually separate and unite with Albania as far back as 1990. Albanians never envisioned a Kosovo under their control to be anything other than Albanian. Serbs, Serbian heritage, and Serbian claims to the territory were all disregarded in Albanian historical memory. Thus, while opponents of Kosovo’s statehood blame Western powers for enabling and empowering erstwhile separatists, it is the very same Western powers that took an active role in redesigning Kosovo to be as inclusive of Serbs and other non-Albanian communities as possible. In other words, independence, which Albanians long desired, would be designed, structured, administered, and defined as an international initiative that would be considerably different from what Albanians actually envisioned. Partition effectively nullifies all of this, upends all international agreements, and gives credence to those not just in Kosovo but in Bosnia and Macedonia who advocate pan-ethnic states. The issue here is that any partition or land swap effectively draws new borders which the international community has been loath to do. Since 1945, the creation of new states out of existing ones has traditionally respected the principle of uti possidetis, which recognises new international boundaries from the borders of preexisting colonial or constituent federal republic units. Leaving to one side the debate over whether Kosovo’s statehood qualifies as meeting this principle since it was a territory and not a federal unit within Yugoslavia, proponents of its independence view its borders to be those it had as an autonomous province of Serbia. Drawing a new line at the Ibar River and incorporating the Preševo Valley is something completely unprecedented in international law in the modern age. Currently, we neither know what Vučić’s plan for “delimitation” is, nor do we know whether any such arrangement will be agreed upon with Kosovo and the international community. What we do know is that such talk risks destabilising an already volatile region that includes Macedonia and Bosnia where groups eager to redraw borders would be quick to capitalise on a new precedent being set. We also know that the United States has again repeated its opposition to any exchange of territories, though its influence in the region is no longer as decisive as what it once was. Finally, a number of NGOs in both Serbia and Kosovo – Serbian and Albanian – have issued a rare joint letter to EU High Representative Frederica Mogherini petitioning her to make an unambiguous statement against either Kosovo’s division or any exchange of territories. All of this should be a welcome sign that rumours of partition may remain just that. If all of this is simply a way for Belgrade to get the international community to increase pressure on Pristina to implement parts of the Brussels Agreement that establishes ZSO, or even as a way to simply test the limits of their diplomatic leverage, it is a dangerous game to play. The same applies to Kosovo where years of stalling on creating ZSO has tested the patience of Pristina’s closest supporters. To suddenly scuttle this arrangement in favour of a territorial swap is irresponsible. Neither partition nor a land swap will benefit anyone involved in Kosovo’s final status. “Velvet divorces” and “negotiated” territorial adjustments are not part of the region’s history and calls to redraw borders and possibly trade territory would almost certainly degenerate into violence and chaotic population exchanges. If groups as disparate as the Kosovo Women’s Network, the Helsinki Commission for Human Rights in Serbia, and the Serbian Orthodox Church all agree on opposing this issue, it is an issue worth opposing. Michael Rossi is Instructor in the Department of Political Science at Rutgers University, New Brunswick, New Jersey, and Visiting Instructor in the Department of Political Science at Long Island University, Brooklyn, New York City. He is currently working with Jaume Castan Pinos (University of Southern Denmark) in an emerging comparative study on parastates around the world. A very thorough analysis. I have poured over it a couple times. Do you think the EU can prevent this? Thank you for your comment. I can’t say with certainty the EU will be able to prevent this, but I’m comfortable suggesting/hoping they will. Even those groups in Bosnia and Macedonia that would be eager to visit border changes that somehow benefit them will lose out in the end. Beyond what ethnic Serbs and Albanians in Bosnia and Macedonia respectfully thing about merging with kin-countries, this will severely undermine whatever political leverage they currently have to the central governments in Belgrade and either Pristina, or worse, Tirana. I agree with the main thrust of this (excellent) article, but find its line of reasoning incomplete. That is, I agree that partitions and that border changes are potentially dangerous and generally ‘taboo’, as the article says; but I also think that (A) Kosovo’s ‘north that has never come under Pristina’s control’, as the article says, and that (B) Kosovo was created by changing borders; for the many states and analysts who believe that Kosovo is now an independent state all agree that before it declared independence it was part of Serbia (as titular sovereign): this means that when Kosovo’s independence consolidated, it changed Serbia’s borders (without her consent). From B it follows that the arguments set out in the article – which are very close to the Western powers’ position in both 2006–8 and ever since (leaving Trump aside) – are both convincing and incomplete: why, one might ask, was a non-consensual border change acceptable in 2008, but is a consensual one unacceptable in 2018? This is not to argue in favour of partition, but to say that political coherence and intellectual honesty require some further elaboration. From A it follows that this ventilated partition would be a very particular one, as it concerns a territory that the mother state does not really control (and, arguably, does not really ‘own’: if, that is, the real basis of Kosovo’s independence and statehood is the effectiveness principle, and not some entitled to secede from Serbia). Again, this is not an argument for partition, but a call for more elaboration (and semantic precision: the linguistic confusion surrounding the whole Kosovo crisis is probably one reason why Kosovo’s president can get away with arguing against partition and for border correction). Thank you for your input. I too agree with the inconsistency in arguing against partitioning Kosovo but advocating for the partitioning of Serbia by separating Kosovo from its parent country. The sad fact is that no matter how one might argue in favor of supporting some sort of self-determination for Kosovo, and no matter how many times said supporters claim Kosovo is “sui generis”, the fact remains all these constructed empirical arguments are rooted in subjective Realpolitik. In so many words, Kosovo is “independent” (or independent from Serbia) because powerful states say it is. But this then seemingly validates the “independence” of other breakaway entities like Northern Cyprus, Abkhazia, and Nagorno-Karabakh, which then throws the sui generis argument into question. It’s beyond the scope of my article to argue for or against Kosovo’s limited sovereignty. Rather, the specific elements regarding drawing *new* borders against existing ones not only raises new security dilemmas for the people affected and unaffected by partition, but also undermines the principle of uti possidetis that took preexisting federal borders as inalienable. Again, Kosovo’s case is debatable even in this principle since it was not a constituent part of Yugoslavia but of Serbia, but Kosovo’s supporters advocated for its secession within those borders. It now needs to uphold those borders. Thank you Michael: I am sorry I see this only now, after having published my own piece. I agree with your first point, naturally, but I largely share also the second. Even though I tend to believe that uti possidetis does not properly apply to K, I am aware that this is a solitary (and probably uninformed) and that the purpose of uti is order, which makes it advisable to stick to it anyway. A similar analysis could be made moving from sheer effectiveness, however: K has next to no control over the north, whereas S has some control over it: in this specific case, therefore, applying uti is likely to be more disruptive than sticking to effectiveness. A lot to disagree with here. On the first point (northern Kosovo), this is a region whose political party (there is really only one) is a branch of the governing Serbian party – but this has only been the case since the region was “integrated” into Kosovo in 2013, before that its leadership was home-grown. It does have an important criminal underground, but this flourishes in the absence of truly effective policing. Kosovo police are present throughout but are weak here. If swapped to Serbia – something I am sure the residents would overwhelmingly support – law and order could only improve. Second, Preshevo Albanians (who would likewise overwhelmingly back a swap) would get improved education, real political representation, and again a police force they can trust. Third, the status of southern Kosovo Serbs (who indeed fear a swap) is ambiguous: to some extent, they are vulnerable because they are seen as the spearpoint in a conflict with Serbia. If that conflict ends with a comprehensive agreement between Prishtina and Belgrade, they may well benefit from lower tensions. But it is far from clear that they are even now more than the “ethnographic novelty” the author fears they may become. The fourth point is simply odd: it is exactly the failure of the international community’s design for Kosovo that accounts for the discussions now under way between presidents Thaçi and Vučić. If that design had worked as planned, Kosovo would already be a member state of the United Nations, rather than technically still its protectorate. It is to get to that point – Kosovo as fully equal, wholly independent, without an asterisk – that a deal makes sense. I find “population exchanges” distasteful but the expulsion of ethnic Germans from Poland and other places after the second World War probably has helped peace and stability in Europe. An unfortunate fact, but I believe it to be true. There will certainly be a lot of dead Kosovar Albanian politicians, consisting of those who supported this land swap deal, targeted by those radical Albanians who opposed it. We will see how effective or ineffective NATO forces are in containing this threat, as the group of Kosovar Albanian politicians who supported negotiations with Serbia will be begging for NATO protection. This would definitely set a precedent that will be exploited by the Bosnian Serbs. Brian Ghilliotti. I think that its best to make a exchange like Serbia gives most of Kosovo to Albania and Albania could give Northern Albania with a coastline to Serbia.I think that with that exchange both sides will be happy.